This tutorial video shows you how to name compounds with a ‘COOH’ or carboxyl functional group using my puzzle piece approach to IUPAC naming. 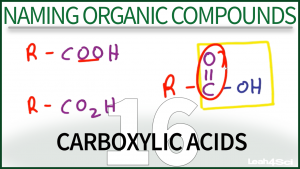 This is Video 16 in the Naming Organic Compounds Video Series. Click HERE for the entire series. I am slightly confused. For the molecule cyclohexanecarboxylic acid, is the carboxyl group considered a substituent group? In that case, should it not be carboxycyclohexane? Also, my sources tell me that the prefix of an aldehyde is alkanoyl so I’m confused. If you can clear things up, that would be awesome. Once again, thank you so much for these awesome videos! With the 5-chloro-2-methyl-3-hexenoic acid don’t you have to specify that the alkene part is E?